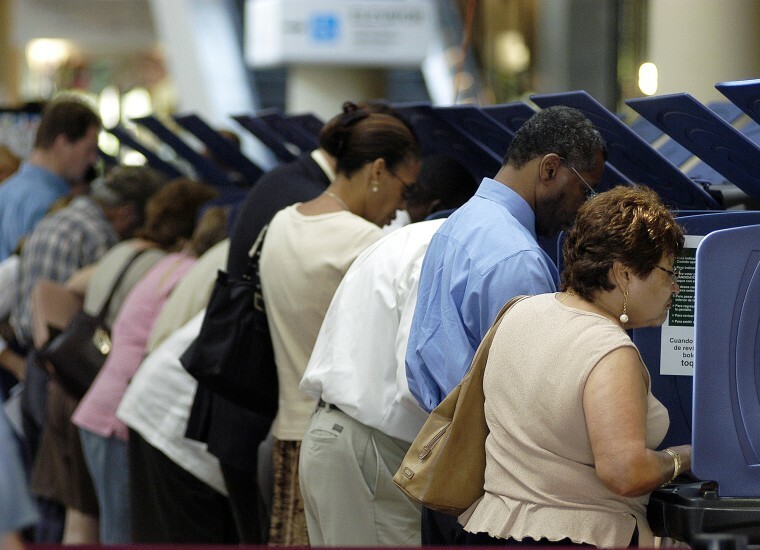 In a recent poll, only 44 percent of Latinos said they were 'certain' to vote Democrat. The DNC's new Hispanic Media Director is ready for the challenge. AUSTIN, Texas — Enrique Gutiérrez, the Democratic National Committee's new Hispanic media director, is taking on the job at a time when his party hopes to harness Latino anger and disappointment toward Trump's policies and have it work to their advantage at the polls. But that's only if Democrats can get their message to Hispanics and persuade them that their vote can help change policies that impact their lives, in areas such as health policy or immigration. Recent polling shows the party has work to do. Gutiérrez, whose hiring was announced Monday, told NBC News he relates to the anger many in the community are feeling now, which was captured in focus groups and research done by pollsters Latino Decisions for a group of Democrat political action committees. Democrats have an opportunity in this year’s midterm elections to get more Latinos to the polls and win more of their votes because of Hispanics' deep anger with the president and the Republican-led Congress, according to the polling. “Latinos are exceedingly angry at the state of politics today,” the political opinion research firm said in an analysis of the polling and focus groups done for the Congressional Hispanic Caucus' BOLDPAC, Priorities USA and House Majority PAC, all political groups that contribute to Democrats. The researchers polled Hispanics in Florida, Arizona, Nevada and Colorado and in 11 heavily Latino congressional districts in other states. It also conducted seven focus groups for its assessment. They found Hispanics’ overwhelming feelings toward Trump are negative and include anger, fear, shame and disrespect. Anger tops the list, the pollsters found, with 87 percent angry over the administration's separation of children at the border and an equal share angry over Republican health care proposals that would leave more people uninsured. By more than two-to-one, Latino voters are more likely to affiliate with or lean toward the Democratic Party than the GOP, according to Pew Research Center. In a generic ballot, Democrats led with Latinos 67 percent to 22 percent and 72-18 in battleground districts, Latino Decisions found. But that is no assurance Latinos show up to polls to vote for Democratic candidates. In the Latino Decisions poll, only 44 percent said they were “certain” to vote Democrat and only 53 percent overall said they are certain they will cast a ballot in November. “Latinos want to know exactly what change their vote creates,” Latino Decisions said in its memo on the findings. Gutierrez has witnessed firsthand how policies can have a personal impact on mobilization. He was a young boy of about 8 or 9 when California’s Proposition 187 — a ballot measure that cracked down on immigrants — brought politics into the mix of his family’s kitchen table discussions. His parents, legal residents from Mexico then, suddenly turned their attention to politics and what dominated their conversations at mealtime. "Prop 187 changed the perspective of my family and my perspective growing up," said Gutierrez, who saw how the harsh policies affected his parents. "I saw a shift in them that we are not really secure," Gutiérrez said. "It sort of changed my life." The effect on Gutierrez lingered. Years later, when he was in community college and working the night shift loading packages onto trailers at UPS — a job that paid well and provided good benefits — he decided he needed to be making change through politics. Gutierrez went on to study political management in graduate school and work on several campaigns before becoming the Hispanic media spokesman for the Democratic National Committee. "The same change that invoked that spirit in me is why I’m fighting the Proposition 187 of now,” he said referring to President Donald Trump’s immigration policies. Gutierrez will have to ensure the party is getting its message across. The polling warned against assuming Hispanics are keeping tabs on the 24-hour news cycle. Latinos are consumed with work, family and community affairs but what is happening in Washington is "only vaguely familiar." Participants in the focus groups showed political sophistication but were not always highly engaged and politically knowledgeable on day-to-day current affairs, the firm said. "We should not assume they are news junkies despite their self-reported news consumption levels — they are not," the analysis states. José Parra, founder of Prospero Latino, a political consulting firm who handled press for former Sen. Harry Reid, D-Nev., said Democrats must stop considering Latino voters as a given entity rather than a constituency that needs recruiting. But that can’t be done just by putting out the Democratic message, he said. The message itself must feel approachable, targeted and genuine or it will fall flat. There are complaints that the same is true for Latino voters, who could turn out many more voters for the party. About 1 million young Latinos who are citizens turn 18 each year. In a private conference call assembled by progressive groups to discuss polling numbers, organizers voiced concerns that the Democratic Party still has considerable work to be done in order to convince Latino voters to come out to the polls this November. NBC News was permitted to join the call that included, immigration advocacy group America’s Voice, the League of Conservation Voters, Planned Parenthood Votes, the 314 Action Fund, which is a science, technology, engineering and mathematics group that advocates on climate change; the National Education Association, Latinos Vote!, which is a program of People For the American Way and America Votes. "Latino voters are crucial to taking back the House and Senate and cannot be taken for granted," said Rep. Norma Torres, D-Calif., who participated in the call. Gutiérrez said getting the Democrats' message to Latinos is the essence of his job; he's worked with Houston Mayor Sylvester Turner, who is African American and captured some of the Latino vote in a race against a rival Hispanic candidate. He also worked for the Arizona Democratic Party and for Leticia Van de Putte, a Democrat who ran for Texas lieutenant governor. “Taking the message to Latinos is key. We know exactly how important they are, especially in midterm elections when Democrats have the opportunity to take over the House and come close to flipping the Senate,” Gutiérrez said. Stephen Nuño, an NBC Latino contributor, reported from Flagstaff, Ariz.